Have you always dreamt of the perfect winter wonderland wedding? A luxury chalet in the Alps is the perfect fairy-tale setting for a snow wedding in a real winter wonderland. Welcome to your mountain wedding where a magical sleigh-ride is the perfect wedding transport, where snow-capped peaks make awesome backdrops for wedding photos, and where the whole wedding party, and celebrations, are accommodated for in a beautiful luxury chalet. One your guests will be talking about for many years to come. If you are looking for a chalet wedding venue with snow for your winter wonderland wedding, we may have just the thing. Our selection of luxury chalets across Europe provide the ultimate mountain wedding setting. A luxury chalet can host a beautiful reception, an atmospheric wedding breakfast, and accommodate all the guests under one roof - the perfect choice to host the whole day. Whether it’s a large celebration for all the family and friends or a smaller gathering, the on-site chalet team can provide a first-class service arranging even the finest of details and will ensure the seamless running of your perfect day. Our Luxury chalets, with many exceptional facilities on offer, give plenty of opportunities to relax before the big day, the spa and massage room could be the perfect place to relieve any nerves with an indulgent pampering. With a chalet chef too, a tailored menu can be arranged for a spectacular wedding feast to suit all your needs. So with all the planning taken care of, all there is left for you to do is listen to the roaring fireplace over the sound of champagne toasts, from the chalet bar, and join in with the mingling guests on the chalet balconies, while overlooking the most spectacular scenery in the Alps. A ski resort wedding combines the stunning scenery of the Alps together with a location devoted to providing its visitors with an unforgettable holiday. This can truly be one of the dream destinations for a mountain wedding in the Alps. From snow-covered traditional churches and helicopter arrivals, through to some of the most luxurious chalets in the world, a ski resort wedding can cater for the Mr & Mrs of ski enthusiasts to the most exuberant snow kings and queens. Organising one is made as simple as possible with a concierge service at the chalet who can put you in touch with local and recommended suppliers from florists to experts on foreign marriage licences. Mountain weddings do not have to be all about the snow. With luxury summer holidays to the Alps becoming more and more popular, this could be the perfect setting for your summer mountain wedding. The Alps in summer have so much to offer, from soaring temperatures, landscapes for the most picturesque outdoor wedding, and of course, luxury mountain chalets. 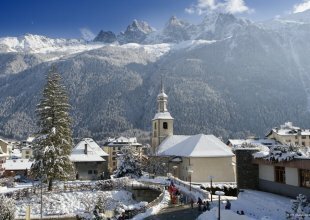 Your wedding in the Alps is sure to be like no other you have been to before! 10. Ski In Luxury to put it all together!